Bega Valley Shire Council’s Treatment Plant Coordinator, Jason Darcy, at the Merimbula/Pambula beach-face outfall. Photo: Brent Occleshaw for BVSC. 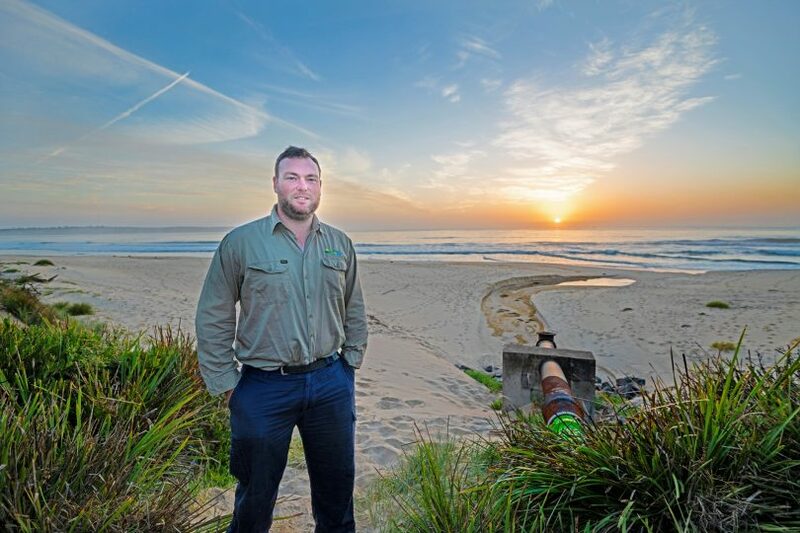 The idea of treated sewage flowing out on to Merimbula/Pambula beach has always raised eyebrows and a sense of embarrassment. The days of that rusty ‘poo pipe’ are coming to an end, but how thrilled will locals be to hear that an ocean outfall is the solution? Bega Valley Shire Council is about to test the plan with the community detailing necessary upgrades to the Merimbula Sewage Treatment Plant (STP) and explaining why an Ocean Outfall is the solution. Water and Sewer Services staff will tour beaches and local markets over the next two weekends, starting at Bar Beach this Saturday, March 9 and Pambula Markets on Sunday. Water and Sewer Manager, Jim Collins, says the tour provides an opportunity for people to talk one-on-one with Council staff and representatives from environmental consultant AECOM who have worked extensively on the project. “We’re targeting local markets as locations where large groups of people gather so we can give as many people as possible the opportunity to have a chat with us,” he says. “We felt it was also important to speak with beach-goers who may have questions about this major project. “During the tour we will outline the results of the marine ecology and hydrographic studies we’ve completed as well as the Merimbula Bay dye dispersion tests, flora and fauna studies and the Aboriginal significance study. “We have to ensure public health standards are met but we are also committed to protecting our unspoilt aquatic and land environments,” Mr Collins adds. The Merimbula STP is one of 10 that Council owns and operates on behalf of the community. The current beach face outfall once did extend beyond the waves, but it was destroyed by a large storm in the 1970s. Since then, treated effluent has flowed across the beach and into the waters of Merimbula Bay. Council says it tries to reuse as much treated sewage from the Merimbula STP as possible via irrigation at Pambula Merimbula Golf Course and farmland at Oaklands. The remaining effluent is disposed of using either dunal exfiltration ponds or the beach-face outfall. According to Council, the NSW Environment Protection Authority has instructed it to upgrade the STP and construct an ocean outfall to dispose of excess recycled water during high rainfall periods. The upgrades are also expected to improve the quality of Council’s recycled water. Merimbula Seaside Markets between 8.00 am and 12.30 pm on Sunday, March 17. #Region Media is taking part in a Council media briefing on the project this Friday, more to come. Just read the article and yes it is a council decision. Do we not learn anything from other ocean outfalls, high levels of heavy metals within local fish species. I just saw a post from the Guardian ( i hope, testing memory) that said salt water fish extinct by 2048., so this idea will help with that one. This is the same council that has for years graded blue metal off a road that then turned to a rutted quagmire in wet times and has now just replaced the blue metal. All at ratepayers expense. Surely someone needs to be accountable for poor decision making. Firstly an older council changed our sewerage treatment from a captured system(big concrete storage tanks) from which methane could be captured to an open pond system, which by the look of things they are just expanding on the idea. Just lift the carpet and sweep it under. Is this solely a council decision ? Very archaic response to our "waste". Surely in this day and age, and given the drought conditions currently experienced and bound to worsen, that a better solution can not be found. For example - why not use the dry solids to make fertilizer? The liquid waste could be treated and used for wetlands, pasture land or the watering of golf courses etc. To keep pumping sewage out into our ocean, just a little further out than before, simply ensures that it takes a little longer for it to get washed back to shore so that all the locals and tourists can enjoy swimming in it. I find the lack of creative thinking astounding. Terrible. Pump the all the treated sewage on the east coast into the drier regions and grow Iron Bark and Hemp. Should always treat the sea and rivers as if we relied upon them for our survival, which of course we do. Given the plethora of information available for reuse options, I feel our council are not fulfilling their role in advocating for the community's best interests. Please visit our FB page for more information on how we can reuse a higher volume of this valuable resource rather than dumping over 70% into our oceans. Australia has over 250 outfalls which equate to two full bathtubs per person per day! See, Merimbula/Pambula Wastewater Alternatives. I also have farmers wanting this resource for their dams and their pastures. If genuine community consultation were to take place, our council would be asking the community for reuse options rather than offering information on what appears to be a foregone conclusion-they are doing the outfall no matter what! Re use. Wetlands. Solar pumps. The possibilities for utilizing this resource are limitless. But no. Let's just dump it in the sea. After all it is the 1960's. Take a leaf out of Canberra's book, the water that goes into the Murrumbidgee river from the "Treatment" works is cleaner than the water in the river. Not me - treat the waste on land - removing it from sight does not solve the problem, just hides it! It can all be treated in tertiary treatment plants on land! !